Last night I got some good news, a sale that I had previously counted, but hadn't turned into anything was confirmed - I was beginning to lose some confidence, as sales had slowed too. But, I chased them up, and they confirmed the sale - woohoo! I've also received another real gamer sale this week - things are looking up. The game was a real nail-biter, Rich got to the mine first and made use of the monetary advantage to get a lot of armies. Outnumbered on cash and armies I had to make a few desperate attacks, which after some disasterous failures finally paid off. I managed to win the mine back eventually, and wiped Rich out at the same time as getting the requisite gold. It was a really enjoyable game because of the back-and-forth nature and the pressure I felt under. Good stuff. Afterwards I offered Rich a few options and he chose my Jorvik prototype (the latest one). We ended up playing four games, I won the first, then we drew the second, I won the third and then Rich won the final game. Rich seemed to enjoy it, and was keen to play more. During the games our scores steadily increased, until the last game when we both suffered at the hands of the events. It felt good though, we both had a strategy, I won the majority of the games which implies a level of strategy, rather than just blind luck, and I found a flaw in the rules, which needed to be address halfway through the last game. I still think Jorvik needs something else, but I felt it went fairly well. One of the things I'm aiming for with Jorvik is a Lost Cities-like experience. Fast games, that are really good fun and pull you in for more. The first time I played Lost Cities, I got utterly creamed but really wanted to play again. When I introduced it to Roman we played five games back-to-back. After each game of Jorvik last night I offered Rich the chance to play something different, and each time he chose another game of Jorvik - I must be doing something right. On the weekend I was down in London for my sister's wedding. I've not been to London socially for many years - probably around six or so, despite only living about two hundred miles away and having family there. I'm not a big fan of anywhere that huge, I prefer a more sensibly-sized city. We had a fantastic weekend, it was really great to see my family (it's usually only at Christmas that I see my sister and her now husband) and everyone was in a really good mood. The weekend was really good fun, we drank (quite a lot in some cases :-) ), we ate - it was great. Bizarrely, I also sold three copies of my game to friends and family. That sounds really bad. I want to make absolutely clear that I was not at my sister's wedding pimping my game. My friends and family had heard about my game from other friends and family and they were interested to hear about it, and how it was going. I told them, and they ordered copies. It was great, and yet wrong. It's my sister's wedding, dammit. Ideally I'd prefer to sell the game to gamers, who are more likely to play it, but I've had a slow few weeks of sales, and I'll take the money gratefully. Sadly I missed Paul's games night again last night as we had various chores to do having been away all weekend, plus I've an interview for a promotion at work today so I had to do some prep this evening, reading up about the subject. Next week. Honest. Sorry Paul, etc., I hope you had a good night. As mentioned last week, Jack has invited me to add my thoughts to this blog every now and then on games that i'm developing. Like many others, I’ve had a few ideas for games over the years and recently have started taking my ideas and developing them into playable games. As with many of my era (Born in the late seventies) I developed a fixation with Games Workshop while at school, my favourite game being Advanced Heroquest, and I ended up spending a small fortune on miniatures while not actually playing that many games! Since then I’ve been a regular gamer and have started developing my own games. The main one that I’ve been working on is ‘Citywise’ a game of a race against time in a future city with players competing to raise the most cash in a 24 hour period (game time, not real time! ), this is coming on well and is starting to take shape. My other games include Steam Car Racers; A Victorian racing game, BMX Challenge; A Card based game, and Space Campaign; A ridiculously complicated game of galactic control. All of the above are just in the idea stage at the moment. I’ll be posting here on a regular basis to update you on my game developments, I’ll gratefully receive any comments and feedback. My friend Dave has been coming round for games for a few weeks, and has recently got into board games design in his spare time. 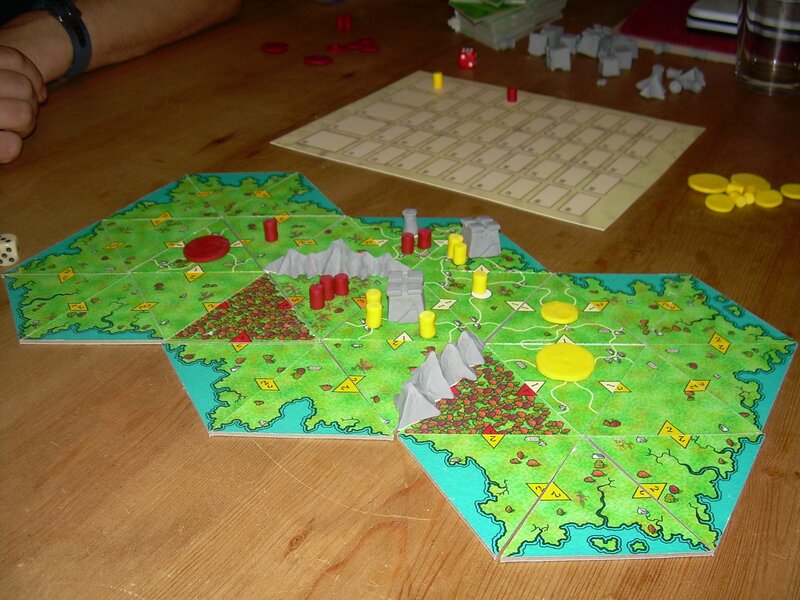 Last time he came round he brought a very early prototype of his first game (known as Citywise), and we played it. It was interesting, and despite some early prototype flaws has real potential. He's got his own board games design blog, and so tonight at the pub I invited him to join Creation and Play as another games designer. I'm delighted to say he's up for it - so hopefully we'll be hearing about his progress here soon. I'm not going to post this weekend as I'm down in London for my sister's wedding - so you'll not hear from me until Monday. Since I've got back from the Psychcon convention in mid-October I've had a few weeks of disappointing sales. I'm not quite sure why this is as I've had some good publicity in the form of Hugo's review. I've put a little less effort into self-publicising (as if I was putting any effort in the first place! ), but I can't see that making much difference. I had been relying on getting the review in BBC MindGames before Christmas, so I wasn't too worried about selling fewer than I had hoped - since I expected a big jump and I was worried that I wouldn't have time to build up a stock for that. Now that I've got a bit longer before the MindGames review is printed, I need to boost my sales a bit. How? Therein lies the problem. I've no idea really. I've had a bunch of advice from various people, but a lot of that is less applicable to me, as I have very few copies available, and don't stand to make much money from it. I'm considering approaching the local paper, and seeing if they want to do an interview or review. I can't imagine that many of their readers will be interested, but they will have a pretty large readership, and maybe doing it just before Christmas will get me a few Christmas present orders. Recently I started help Dave playtest a game he's designing and I received a submission from another designer who would like me to publish their game. It's been an interesting experience, and until now I've only playtested my own games, and been on the receiving end of feedback rather than had to give it myself. It made me think of what I wanted from playtesting feedback, so here's my thoughts on reviewing a product in development. Feel free to disagree (or back me up) in the comments. The designer will have invested heavily in their game, they will have given up lots of their time and effort to get it to the stage it has finally reached. They now think it's good enough to play with others, and as you would expect they would like to hear that you think it's good too. However, they need to hear its weaknesses. You can get blinded to the bad points of something you're heavily invested in - it takes someone from outside to see the wood from the trees. So slag it off? NO! The key is constructive criticism. Look for both good and bad points and relate them both. Remember your opinion on the game is just that - a personal opinion. Try to separate the game from the designer and avoid personal attacks - these won't lead to your feedback being considered. Having said all that, be honest. If you don't like something say so - and provide reasons why. Suggest alternatives - they may well not be used but they are more constructive than just slating it. I think it's also vital to have a pen and paper handy when you're playtesting a game too. That way to can make a note of things while playing the game without breaking the flow of the game too much. You can discuss the pros and cons afterwards without have to keep them all in memory while you're playing the game. In other news I finally got some gluing done last night - enough to finish off that batch of four games. Once they are finished I should have some stock again. I got round to Paul's again last night for Monday night games. It was Andy, Greg, Paul and I. We first set up a game of Flanderen 1302 by Wolfgang Panning and Hans-Joerg Brehm. Andy and Paul explained the rules to Greg and I who sat there looking bemused. I don't know about Greg but I certainly didn't really have a clue what I doing for at least half of the game. In the game you collaberate to build six cities: Leuven, Gent, Ieper (Ypres herein after referred as Leper), Brugge, Utrecht and Luik. When a city is finished it is scored - with the player who built the most of their districts in the city getting the lions-share of the points. You can also increase the value of a city by building a religious district, or build a district belonging to the neutral player to scupper your opponents. Since you can't place two districts of the same colour next to each other neutral placement can make things really awkward for the others. You also have a limited number of the pieces of each of three different shapes, making things still more complicated. I scored low for the first few cities, but then I started to get the hang of it. Then I ran out of pieces! Paul and Greg were winning by a fairly long chalk, but they had got their points early and Andy and I did fairly well out of the last few cities. In the end the scores were fairly close: Greg 46, Me 42, Andy 36, Paul 34 and neutral 8. Greg and I set out to try and beat the neutral player, so in some senses we won! We finish the night off with a couple of quick and chaotic games of Guillotine by Paul Peterson. It's fast, it's funny and it's great fun. The more I play this one the more I like it, despite the complete inability to plan a strategy. The cards are entertaining and well-illustrated in a comic fashion. I seem to do alright at this one - first game: Paul 17, Me 17, Greg 12, Andy 11; second game: Greg 23, Me 22, Paul 19 and Andy 12. Yet another very enjoyable games night at Paul's. I really need to make more of an effort to get there more often. We had a second game of Mission: Red Planet before we left Bristol yesterday. This time I chose more adventurous bonus cards at the beginning as the +2 I'd chosen in the first game was pretty lame, with everyone else getting around 6-8 points for theirs. I got +8 if you have the most astronauts on Mars. At that point I made a concious choice to play the recruiter early, so that I could play those characters which get me two (or three) astronauts onto ships twice. I also tried to play the Explorer in the scoring rounds to maximise the number of locations I would score. Fairly early on I played the Scientist, and got a second bonus card that was worth 6 (I think) if you collected the most of the most expensive ore. So I was aiming for those territories too. After the second scoring during the turn eight, I was winning by a hefty amount, although Matt was definitely getting more astronauts on the planet. However, it all went a bit Pete Tong in the end. I'd used up my Explorers in turns five and eight, the first two scoring rounds, which were worth as much combined as the final scoring. With my healthy lead I was the person to target so I was attacked a couple of times with Soldiers and the like, and those who chose the Explorer in the final round were able to out-maneouvre me on the surface. As a result Suzy got the most of the most expensive element and Matt had the most astronauts on Mars. Neither of my bonus cards scored me any points. Plus I'd lost control of a couple of territories in the final turn, and hence didn't score very well. The Wife managed to surprise herself as much as the rest of us by completing both her bonus cards in the final turn and getting the bonus for having the most ice tokens. Final scores: The Wife 40, Matt 39, Suzy 33, Me 30. I'm off to Paul's tonight for more games - woohoo! Session report up tomorrow all being well. I'm staying at the in-laws this weekend, and they're games people so we got a few games in yesterday. I finally got around to playing Mission: Red Planet a Steam-punk area control game by Bruno Faidutti and Bruno Cathala. It has a similar character-selection mechanic to Citadels also by Bruno Faidutti, but this time everyone has their own set of characters so that multiple players can be the same character. In a similar way to the paddle cards cards in Niagara you cannot re-use a character until you play the Recruiter character. I really enjoyed the game, it lives up to the hype in my mind. It helps that I like Steam-punk stuff generally, and the production quality is great, with really nice artwork. "I think Artist is the better game, but it makes my brain ache - so I prefer Jorvik." A vote for both games in a single sentence! He must be a politician. We've come down to Bristol again this weekend to see the in-laws. Last weekend only I came down and I didn't really see the in-laws at all, so this time it's both of us. I didn't get the Codename: Artist prototype finished last night before we left as I left work late, so I had no time once I got home. I've brought it with me though, and I expect to finish it off in the next hour or so. It's a very simple game in terms of components, but it should provide the players with a lot of options at every turn (diminishing towards the end of the game) not unlike Hey! That's My Fish!. I don't yet know whether this will make it bewildering or vulnerable to analysis paralysis. There's only one way to find out. It's been a disappointing week for sales of Border Reivers. Since the Psychocon conference I've not sold many copies at all, although I've been on holiday and not attended any more conventions. Hopefully the review in BBC MindGames will drum up some interest, but for now I ought to put some more effort into publicity. My Dad gave me a single word last Sunday and asked me to design a game around that word. The word was the name of a modern artist. I spent a decent chunk of my train journey back from Bristol last weekend thinking of a game inspired by the artist's work. It was the birth of Codename: Artist an abstract tesselation game. Last night, before a trip to the pub with some friends I started to knock up a prototype of Artist. Because of its abstract nature (and a short list of simple components) it should be much quicker to construct than Sennon, so it's snuck up the prototyping list. I hope to finish the prototype tonight before we go back down to Bristol again to visit The Wife's family. The Wife's family are gamers, so I hope to get some games in, possibly even of my prototypes. Mission: Red Planet is another strong contender as we bought it as a birthday present for Matt. I first moved to York just over two years ago. At that time I was working from home and commuting to Newcastle for two days a week. We were living in a small village outside York which suffered from lame bus service. I didn't drive at the time either, so I was fairly isolated. It was a year before I started working locally and passed my driving test, by which time the only people I knew in York were friends through The Wife's work. One of the best things about deciding to get Border Reivers finished and start selling it is the number of new friends I've made. At the playtesting event I held I met Paul, Greg and Spence who I try to meet up with once a week for games. I've started going to Beyond Monopoly, where I've made even more friends, including Dave my Space Hulk buddy. Plus I've a bunch of internet friends who I might have only met very briefly, but I'm getting to know through this blog, other blogs and podcasts and BoardGameGeek. It's great that a personal project such as giving up your social life to self-publish a game you've designed can lead to a bunch of new friends. In other news, I finished the batch of four games last night except for the tiles. I've an opportunity to do the gluing for the tiles next Tuesday in a friend's garage, so the end of this batch is in sight. I finished off the cards last night while listening to Luke's Happy Happy Baord Games Love-In podcast. It was my first venture into the world of podcast listening, and although I only had time to listen to the first episode, I can see that this might become almost as dangerously addictive as blog-reading. Oh dear. Great stuff, Luke! Well, I made my first sale at Midcon! Whoooo! Now gotta get a move on to finish off my customer's copy! Great feedback from those who played (the level of strategy seemed really high with four player, 20 cyclist racing) and plenty of people who stopped by said that they seriously thought it was pro produced...Which was nice of them! A couple more certain preorders so things are looking up - time to kick on with finishing the typing up of the rule book then! I finally got back to constructing again last night. I got very little done last week due to a few social events and the unexpected trip to Bristol. I'm still working on that batch of four copies I started a week or so ago. All I had left to do on them was the decks of cards and the tiles. The tiles are on hold until I get an opportunity to do some gluing (I had intended to spend a day gluing last weekend while The Wife was away, but instead spent it down in Bristol). So I started on the decks of cards instead. I didn't get as much done as I would have liked as I didn't get home from work until late and I decided to bite the bullet and go and buy a new cutting mat before I started. I'd had the previous cutting mat for many years and Border Reivers had finally done for it - the cutting surface was trashed. The new mat is great and it leaves a much nicer finish on the things I'm cutting. I really should have changed it earlier. I'm away again this weekend, but I'm visiting my in-laws so there should be some games opportunities and possibly even some playtesting and prototype making opportunities. Yesterday I had the meeting with the reviewer from BBC MindGames, and I introduced Border Reivers, then we played a game. I thought the meeting went well, she seemed to enjoy the game and with a few pointers got into it well. In the end she won, after I had some terrible luck in combat. I managed to wrest the mine from her and push back her other flank, but she came back at me, and waded through my armies like they were decrepid old folk, unsure of which ends of their weapons to stick in their enemies (it's the pointy end). I spent a lot of the game short on armies as a result of the slaughter of my ineffectual troops, though my choice of the Training Camp did help me out a little there. As I left she said it should appear in the January edition (out on 5th December), and gave me a copy of this month's magazine for the train. I enjoyed the magazine (their Ten Best Games For Christmas beat the pants off The Independent's, and featured three Euros - Settlers, Lost Cities and Carcassonne). The puzzles had a nice range of different types and difficulties. All in all, it was an ideal magazine for me on the train. I also spent an hour or two working on the game idea Dad had sparked by giving me a single work. It's now Codename: Artist. It'll be an abstract tesselation game, for 2 or 5 or 6 players. I think it has some potential, but I need to get a prototype together and start playing it to really find out. When I got home last night there was more disappointment though. Unfortunately the reviewer's editor had already 'locked' her earlier version, so the review is not going to come out until after Christmas after all. D'oh. After going all the way down there I still don't get the pre-Christmas review. Still, it can't be helped. We had a really nice day yesterday, with all my siblings coming round for dinner at Mum and Dad's. It almost felt like Christmas, with the exception that The Wife wasn't down here with us. Yesterday I made another prototype for Jorvik (number four? number five?) and then played it twice, once solo and once with my Dad. I think this one is better than the last, but I'll need to play it several times to be sure. I was glad that Dad picked it up quickly (he said he was strategising by the end of the game), as he's really not a gamer, so the fact that he could pick it up so quickly shows me that I've pitched the difficulty about right. The hard thing is to keep some strategic options in the game when the game is fairly simple. Towards the end of the day Dad also gave me a game title. Just one word. I didn't recognise the word, but it turns out it is the name of a modern artist. He then showed me some of that artist's work. This morning I've already been thinking of how the artist's work could inspire a game. I've got a few ideas, so that should keep me busy, scribbling in my notebook on the train. I'm off in a minute to go and play Border Reivers with the reviewer from the BBC MindGames. I'll let you know tomorrow how it goes. I'm obsessed with games. There. I've admitted it. They say the first step is to admit you've got a problem. I'm down in Bristol visiting my family. Yesterday we went on a sort of stag & hen do, with my family and Dan's family. The girls went on a treasure hunt, and then for dinner, the boys on a tour of Bristol, and then for dinner, then we met up for drinks afterwards. It was great for the family to get together, as with the exception of Christmas (and the forthcoming wedding), we don't do it. In fact it felt a bit like Christmas, with us all round at Mum & Dad's, with the exception of The Wife who's in Edinburgh visiting a friend. The ladies left fairly early in morning, which left Dad and I in the house alone. Conversation turned towards Reiver Games, and we must have spent a couple of hours discussing how it's going and what my aspirations are. Dad's run a few business ventures over the years, always in his spare time, as he was a teacher for over thirty years in his main profession. It's good to have a sounding board for ideas, and also to get someone else who has had some experience to discuss issues I may not have considered. I really appreciate Dad's input, and I like it that he's so interested and excited about the project. I've also asked him for some artwork for Jorvik, which he's very keen to help with after Christmas when he's less busy. Today I'm going to make another Jorvik prototype this morning, and then later on my brother is coming round and we're going to have a family meal in the evening. My sister has brought a Christmas pudding - so it'll be even more Christmassy! I've come down to Bristol for the weekend to see my family, attend a dual-family gathering in preparation for my sister's wedding and to teach the reviewer from BBC MindGames to play Border Reivers. I'm at my parents for two or three days, so if I can get my hands on some card I can make use of Dad's swanky guillotine and knock something together. There's every chance Dad has some card lying around. I'll also be discussing the Jorvik graphic design with Dad - he's very interested in my games design venture, and keen to help out where he can. Wednesday featured a disappointment on the publicity front. A couple of days after hearing that a review of Border Reivers would be in the edition of BBC MindGames Magazine that comes out before Christmas (when everyone has money to spend and is looking for presents) I heard back from the reviewer to say that it will slip to the February edition which comes out in Janurary (when everyone is skint). Apparently the reviewer is unused to that type of game and was finding understanding the rules tricky. This was a bit of a blow as I was hoping to gain a boost in sales from the review. A bit of thinking on my feet and I worked out that I could pop down to Bristol this weekend (since The Wife is away anyway) and explain the game to the reviewer. I checked with my parents (who live down there) to see if I could crash at theirs this weekend and that was great as there was a tame joint families stag and hen do for my sister and her fiancé that I could attend. I hurriedly arranged a meeting with the reviewer, got Monday off work and booked train tickets. I asked if this would bump the review back to the January (out in December) edition, and they thought it would, it would be tight - but possible. Excellent news. They even thanked me for offering to come down and explain the game! It's they who are doing me the favour, not the other way round - as they are hopefully providing free publicity to a lot of people just before Christmas. I thanked them back. I also noticed that Hugo of Bode Gueims has posted a very nice review of Border Reivers on his blog and BoardGameGeek. It's been on the front page of BGG all day and will hopefully generate some interest. Thanks, Hugo! Upon checking my email last night I got a third piece of good news on the publicity front. A few weeks ago I was interviewed via email by Mike of Psychocon fame for the Flagship games magazine. I'd got an email from the Flagship guys, congratulating me on a good interview and asking to buy a copy so they could review it! Wow, great stuff. Thanks, guys! What a rollercoaster ride this games design lark is. Wednesday evening I was quite disappointed, now I'm on top of the world. It never ceases to surprise me how much support I'm getting from the UK games community - it's really great. Tuesday night Dave came round again for games. As before, the headline act was Space Hulk the old Games Workshop game with a very similar feel to the Aliens film. As a bonus, this week we had a warm-up act: a game of Dave's own devising. We set up Dave's game and he talked me through the rules - it was interesting being on the other side of this, in the last few months I've explained the rules of Border Reivers a lot, but this was the first time I'd ever played another designer's prototype. I'll not go into much detail of Dave's game as it's his job to decide how much information about the game he wants to make public and when, what I'll try to do is get across how the evening felt from a playtester's point of view. First impressions of the game were good, the prototype was well-made and visually interesting, and I could tell from one look at the board what the theme was. If anything, the prototype was over-produced, as this was the first time Dave had played the game, so a lot will change over the coming months. While he explained the game Dave was quite self-deprecating, which I was told I was doing at The Cast Are Dice - it's obviously a common reflex. However, if you start disparaging the game you've designed, you'll put players off. The game had several things I really liked: fixed length; a clearly defined beginning, middle and end; some excellent events. It also had it's fair share of weaknesses, as you would expect from a game in the very early stages of development. The first few plays of one of my games are awful, as it takes time and practice to take the ideas in your head and turn them into something that works in reality. It came in at around an hour, and although I was at a loose end a couple of times, at no point was I bored or regretting playing it - a good sign. After the game, we went through the notes I had taken about the things I liked and disliked about the game. We discussed possible solutions to some problems the game had and ideas for ways the game could be changed. It reminded me how much my playtesters had influenced the design of Border Reivers, especially The Wife and Mal, who contributed some excellent ideas to the finished game. One of the things I do is keep a list of people who have playtested a game I'm working on - they definitely deserve a mention in the rules for their contributions. Both sides have definite tactics, with the stealers wanting to stay out of LOS for as long as possible. They are also far more powerful when they attack in waves, that way you can maximise the chance of a weapon jam being capitalised upon by a stealer, as you will undoubtedly lose a few before the weapon jams. Marines on the other hand want to keep as much distance between themselves and the stealers as possible, and excel when they can cover a long approach with overwatch fire. Great stuff. I had hoped to do a load of construction this weekend, however I might have to go to Bristol instead. The reviewer from the BBC magazine had some difficulty getting their head round the game, and wanted to play it with my parents (which would be a case of the blind leading the blind :-) ), and conveniently there's a do on, in preparation for my sister's wedding this weekend so I've an excuse to be down in Bristol. We shall see. Monday night I finally managed to get to Paul's games night. He's cancelled a few weeks due to illness, and on the occassions that he did hold it, I've had to cry off for various reasons. It was great to be back. Paul's still not back to his usual self, and due to new babies and various other reasons we were down a few regulars, so it was just Paul, Greg, Vin and I. While we waited for Vin to arrive, we played a couple of games of Hey! That's My Fish! with Paul's wife Lisa joining in. Lisa, is very much in the vein of The Wife, i.e. she won both games convincingly. Still, despite being soundly whooped, I love this game. It's so quick and simple, and yet there's a surprising amount of strategic depth, with every move from the initial placement of penguins onwards being a wealth of options, and each of those options begetting more options in a very wide decision tree. Once you factor in the chance to screw your opponents out of fish, and the gut-wrenching decisions caused by only being able to move one penguin each turn, it's a fast and very fun game. The only real downside is the ludicrous box size in relation to the contents. It's a very wasteful box, both in terms of raw materials and space, and with my environmental concerns and tiny flat that might be enough to put me off buying it. These set the scene for the rest of the evening - silly and entertaining :-) Coupled with Vin's choice of music (he had DJ rights due to his imminent birthday), I also received an education - even if none of us could agree on the genre of the bands. Final scores for H!TMF! : Lisa 29, Paul 28, Greg 21, Me 20; Lisa 34, Greg 23, Paul 21, Me 18; Me 29, Greg 22, Paul 20, Vin 20. The second game of the night was Masons. This was the second time I had played, but that didn't help much, after a slow start for Paul, I soon dropped into last place, but through frantic swapping of cards (a catch-up mechanism only available to the losing players) I managed to get a couple of decent cards for the final scoring round, and ended up acquitting myself respectably, if not admirably. I like Masons, but it doesn't grab me as an excellent game - it'll be interesting to see how that changes with more plays. Final scores: Greg 147, Paul 137, Me 133, Vin 121. We wrapped up the evening with a game of Niagara. This was only my second game of Niagara, and again I really enjoyed it. Very quick and fun, with some really innovative mechanics and gimmicks. This time I could play more strategically, and I really enjoyed trying to second guess my opponents. I nearly won, but Paul managed to stop me by stealing my gems. In the next turn he had to do it again to Greg to stop him winning, but then Greg won the turn after anyway. Final scores: Greg one of each, Paul 6, Me 4, Vin 4. Another great night of games - no new games this time, but some really good ones I'd played before, in the company of friends - an evening well spent. Plus, as an added bonus, I scrounged a lift from Greg this week, so I was able to have a beer - bonus! In other news, Yehuda recommends a very interesting article on The Journal of Board Game Design considering Board Game Designers as auteurs. I can say without a doubt I don't consider myself an auteur - with a body of work of one published game there's no opportunity for common themes, mechanics or artistic statements throughout my output. Or 100%, depending on your outlook - either way I'm not one. In addition, last night Dave came round for games again last night. We played the first public game of his game design, plus some more Space Hulk. Session Report up tomorrow. So, I've splashed out on spray glue so now the game making is DEFINITELY official. My current maths places the cost of each game at around £17-18 as long as the glue doesn't turn out to be a complete rip-off and run out every night - in which case new glue will be found! It's all ready to roll at Midcon - I'm paying for counters and dice tomorrow (which they can deliver Thursday/Friday) and I've got boxes coming tomorrow. I had cover photos taken on Sunday so I need my photographer friend to send 'em my way and that's that sorted. Things're definitely starting to look closer to completion and about time too! The Wife's sister and her boyfriend were up for the weekend - hence no blogging. We had a great time - we'd not seen them for several months and it was great to hang out with them again. They're games guys too, and they don't get a chance to play very often - mainly with us at Christmas and when they visit us. First up on Friday night was Ticket To Ride. It was the first time Matt and Suzy had played, but they enjoyed it, and were competitive, but despite our best efforts The Wife won by a huge margin. Cue some playful ribbing from The Wife. Oh, the shame. It had been a while since Suzy and Matt had visited, so they hadn't seen the last couple of year's additions to my games collection. Surveying the games available, Matt seemed very interested in Twilight Imperium Third Edition (herein after referred to as Twiglet for the sake of brevity). So after a brief trip into town (during which I found out that the review is not in this month's copy of BBC MindGames, I bought Carcassonne: Inns and Cathedrals and delivered a copy of Border Reivers to a friend at Beyond Monopoly), we sat down for a game of Twiglet. Our previous games of Twiglet have lasted between 2.5 and 10.5 hours - it's an all-day game. However, we didn't sit down to start until gone three, and by the time we'd set up the game and explained the rules, it was five o'clock. Past experience had an estimated finishing time of between 7:30pm and 3:30am! As it turns out, the game (only) lasted about seven hours, so we finished around midnight. It was the first time the 'Imperium Rex' card had come out - which instantly finishes the game. At that point The Wife had nine VPs and I had seven. So she won again: two for two, not bad. We both would have got to ten that turn, but The Wife would have done it first, so even if Imperium Rex hadn't have come out she'd have won anyway. Good work. On Sunday we went out for a day trip to Whitby, which by the time we got out on the pier was... bracing. I popped into a couple of traditional games shops, one was a great disappointment, the other was great. In addition to their large selection of traditional games, chess sets and wooden puzzles they had Blokus, Carcassonne, Puerto Rico and Settlers of Catan prominantly displayed, and The Wife spotted more modern games on a lower shelf. It's great to see these games getting the exposure they deserve. That evening, Puerto Rico and Carcassonne both hit the table, I won Puerto Rico (at last! Redemption! ), with The Wife and Suzy winning one game of Carcassonne a piece. All in all, a great weekend, with a nice amount of gaming too. Luke (HamsterOfFury) who posts here about his game design efforts has started a blog/podcast with the best name imaginable: The Happy, Happy Board Game Love-In. I heard from BBC MindGames this morning that the review will be in the January edition (out 5th December) and it will reach a staggering number of people. I finally made it to Paul's for Monday night gaming last night, I'll post a session report tomorrow (I'm a bit behind schedule). Dave is coming round again tonight, probably more Space Hulk, plus an opportunity to play-test a game he's designed. Cool! Perhaps November won't be so games-dry after all. Border Reivers has required a huge investment in time. It's required a large investment in money, but a huge one in terms of time. For the last ten months or so I've been spending a very large proportion of my free time on Border Reivers. Initially there was sourcing materials and doing the artwork, now I spend a lot of time on construction and blogging. Border Reivers has been more successful than I was hoping, and with the review and interview coming out in the future and hopefully some reviews appearing on BoardGameGeek soon, it will hopefully continue. Still at the current rate I expect to sell out within six months. That's a long time. In the mean time I'm working on other game designs - all of which will require time to bring to fruition. In some ways my real job helps, in that I can finish as early as 14:50, and come home to post copies or do some construction, in other ways it doesn't. Most of the time I get the bus to work, and due to the journey time and the lack of choice of bus, on those days I'm out of the house for eleven hours - that doesn't leave much time for construction. Board game design is hard work - it takes a lot of time and effort. Sometimes I wonder about the wisdom of taking it on, in addition to a full-time job. But, I still enjoy it, and it's a great feeling when you hear from people who really enjoy your efforts. I'm also amazed at the number of people who are doing it. The number of people I know or have met who are designing games is huge - much larger than I expected. It's great stuff - the more games designers who are at it the more great games we'll end up with. Sure, not all of them will be great, but some will. I've received my first submission from another designer, and somehow need to work out whether it's worth the time, cost and effort of publishing. I've no idea how to go about that yet, other than play it a lot and see if I like it. I've done a fair bit of construction the last couple of days, made some good progress. I've finished the boxes for the batch of four copies I'm working on (including labelling), and I've bagged up the components. All I need to do now is cut out the scoreboards and mountain ranges (five minutes per game), make the decks of cards (half an hour) and glue and cut out the tiles (one hour). We have visitors this weekend so I won't get anything done for a few days. I'll not be blogging for a couple of days either. Have a good one. Inspired by a habit of Brian's over at Tao Of Gaming, I'm going to start doing a round-up of the month's gaming activity every month. First up, games played. I played a lot of games this month, mainly due to several events: Beyond Monopoly, Dave coming round for Space Hulk, a games night, Psychocon in Leeds and a week-long games-fest of a holiday. Total games played in October: 52. 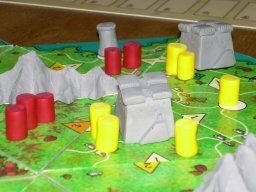 Carcassonne: 12 plays (including the River, Traders and Builders and/or King and Scout expansions). Border Reivers: 8 plays - seven of those at the convention. Ticket To Ride: 6 plays. Apples To Apples: 2 plays. The Really Nasty Horse Racing Game: 1 play. Hey! That's My Fish! : 1 play. Leonardo da Vinci: 1 play. Football Tactics 2006: 1 play. I had not played eight of those before (Formula Dé, Perudo, Street Soccer, TransAmerica, Saboteur, Niagara, Leonardo da Vinci and Football Tactics 2006). So it was yet another good month for experiencing new games. As part of my quest to become a better games designer, I want to play lots of new games - improving my breadth of experience. Good progress made towards that goal this month. Which was my favourite new game? It's a toss-up between Niagara and Football Tactics 2006. Niagara probably just wins it by a nose. It's fast, fun, simple and features several innovative ideas (the clear discs representing the river, using the box as part of the board). I bought one new game this month (Lost Cities), which has already got a good amount of play - a good choice, methinks. I like that it's fast and has a reasonable amount of strategy - the randomness doesn't put me off at all. Looking forward November, I won't play anywhere near as many games, as I'm not attending any cons and I'm going to miss one of the Beyond Monopoly sessions due to visitors. Hopefully I'll get along to Paul's games night a few times, and see more of Dave though. Games I'm most looking forward to playing: Mission: Red Planet and Canal Mania, especially after Chris Farell's positive write-up. Hopefully I'll get a chance to play these this month. So that's October from a player's perspective, how about a designer's perspective? Border Reivers had a good month. I sold nine copies, including four in one week - the second highest ever weekly sales. It was well received at Psychocon, and has gained four more ratings on BBG, boosting its average above seven. I've finally got some sales to North America too, two to the US and one to Canada. I got in contact with the BBC MindGames magazine, and arranged some free publicity, and I was interviewed for a piece in Flagship magazine, though neither of those publicity effort have bourne any fruit yet as the articles have yet to be published. Codename: Sennon has seen a fair amount of new ideas, and a first attempt at a rules set and component list. I had hoped to take a prototype with me on holiday, but I ran out of time to make it. I'll need to get the prototype made this month in time for playing at Christmas with family and friends. What does November have in store? I'm hoping to get a couple of new prototypes done for Jorvik and Sennon, and the BBC review comes out this week. I hope that I'll get a bump in sales from the review, but I've no idea if I will or not. The magazine is aimed at puzzlers (sudoku and crosswords, etc.) so they might not be interested, or I might get swamped with orders. Something between those two would be best - a modest bump in orders, but not so many that I really struggle to fulfill them. Well, I've finally got around to making copies again. The presence of a few copies in stock has taken the pressure off a bit, so I've slacked off - especially with the holiday. However, the BBC magazine comes out this week and I've no idea how much interest that will generate, so I ought to get some more copies ready just in case there's a rush as a result of the review. We shall see. I've started another small batch, I didn't get much done last night, just a few boxes constructed (but not yet labelled), however tonight should be more productive. I've had some more good news too: as a way around the gluing outdoors problem (I can only do it during daylight in good weather - both of which are in increasingly short supply), a friend from work has offered me the use of his lit, rooved workshop. That will allow me to do the gluing after dark whatever the weather. Great. In other news, I've had a couple more queries from the States, and got royally lamped at Carcassonne again by The Wife last night. One of the enquiries from America has ordered a copy, the other not as yet, I don't know if it will come to anything - as ever the exchange rate is against me, but we shall see. Tomorrow I'll post a summary of October, how the month went for me in terms of games and games design.